Cities are quickly becoming the beating hearts of civilization. The UN estimates that over half the global population now calls urban neighborhoods home. Packed with ever more mouths to feed, bodies to transport, and skyscrapers to heat or cool, cities demand the best of human creativity and productivity to meet the needs of so many in so small a space. The reward for such a challenge is great. Cities set the stage for players of innumerable backgrounds to embrace differences and create a community together. Obstacles abound to achieve such a vision, including access to electricity, clean water, and efficient transportation. All these challenges will require innovative technology to make the urban landscape a clean and sustainable living space for billions. In her debut book, Science and the City: The Mechanics Behind the Metropolis , Laurie Winkless explores the best scientific ideas and minds preparing our cities for this world of tomorrow. Winkless acts as an endlessly curious guide on an entertaining journey that zooms along as fast as a maglev train (the fastest train in the world, using magnetic levitation, as you’ll read about in the book). Thankfully, her scientific training shines through her accurate descriptions of widely ranging technologies, and her fun, free-flowing writing style will be accessible to most readers. Although the sheer number of topics covered sometimes detracts from the depth of explanations, it is easy to recommend this book to anyone interested in learning about the technology that has carried cities into the present and the bold ideas that will push them into the future. 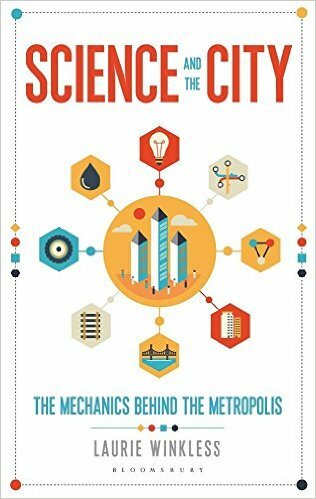 Science and the City: The Mechanics Behind the Metropolis is organized into seven central chapters, each covering a primary component of the city: skyscrapers, electricity, clean water access, roads, cars, trains, and connectivity. Each chapter is subsequently divided into a “Today” section, which describes the history and technology of a particular topic, and a “Tomorrow” section, which highlights just a few of the scientific ideas that could forever change how we work, live, or play in cities. This split between past and future is a simple but very effective organizational tool to introduce readers to early technologies that serve as building blocks for inventions just around the corner. I only found myself wishing that Winkless let us spend more time with the “Tomorrow” section of each chapter, which usually ended just as her enthusiasm for all the future technological possibilities became contagious. Indeed, Winkless’s insatiable curiosity and unabashed love for all things science resonate as the pulsing heartbeat of the book. Her curiosity is infectious as she asks simple questions about things we take for granted (why do skyscrapers have revolving doors?) and explores them in a way that reveals ingenious engineering choices and teaches us some science along the way. Winkless makes both the awe-inducing and mundane aspects of city life engaging, thanks to her excitement about every topic covered. Science and the City will take you from a massive pendulum at the top of a skyscraper that withstands earthquakes all the way to the burrowing of subway tunnels beneath your feet. You’ll learn about self-cleaning windows, fog-sucking nets modeled after the biology of beetles, and the technology behind driverless cars. Even tunnels become a fascinating engineering marvel under Winkless’s guidance, as she confesses to be a “closet train and tunnel nerd. Writing about them has unleashed a monster of epic proportions.” This playful, charming tone permeates the book and should easily draw readers in to share her adventure. Science and the City: The Mechanics Behind the Metropolis is not merely a list of technologies. Winkless incorporates quick physics and chemistry lessons to help readers understand the science behind each technology. Readers will receive a crash course on the physical concept of resonance while learning about earthquake-resistant skyscrapers. A discussion about solar cells and batteries takes a detour into energy conservation. Learning about train locomotion requires an understanding of gravity and friction. Such scientific discussions show respect for the reader’s intelligence and encourage citizens to be informed about how their gadgets operate. Winkless’s scientific background shines in these sections as she provides concise and accurate accounts of the scientific principles behind most technologies. The author’s training in physics also stops her from viewing every future technology with rose-colored glasses. A healthy scientific skepticism seeps into many discussions, ranging from the environmental friendliness of electric cars to research on water use in agriculture. In some cases, she even performs back-of-the-envelope calculations to validate or refute claims by innovators that a certain technology will be cheap or revolutionary. This skeptical perspective increases my confidence in Winkless as a guide through such a vast number of scientific disciplines, from engineering to biology to chemistry, that support the modern cities of today and tomorrow. Winkless’s greatest challenge probably lies in trying to cover so much material on so many interesting topics in just under 300 pages. This all-encompassing approach works well in cases when the topic is narrow by definition (the first chapter on skyscrapers works well) but stumbles in others. For example, the chapter on electricity speeds through a discussion of transformers, the grid, solar cells, wind turbines, and batteries, and even squeezes in a physics lesson on electrons. Only several pages are spent on each topic, so that by the end the reader is left exhausted and overwhelmed by the sheer amount of information. This approach also oversimplifies certain scientific explanations to fit so much material into one chapter. In the end, Science and the City works best as a broad survey that will leave readers wanting to search for more information about a particularly fascinating technology from other sources. This broad approach also causes the narrative focus to sometimes shift away from cities. The chapters about skyscrapers and trains are most engaging because they always maintain their connection to city-specific challenges and technical solutions. In contrast, the chapters about electricity and roads cover physical concepts and technologies that could apply to cities or rural areas, losing the precise focus on cities suggested by the title. The discussion of these technologies is still informative and engaging, but readers who are looking for a more specific discussion of city-specific challenges may be disappointed at times. In Winkless’s own words, Science and the City is her “scientific love-letter to the great cities of the world,” and she largely succeeds in injecting this curiosity and passion into the readers as we follow her whirlwind journey from skyscrapers to sewers. The book is packed with information, highlighting both historical context and the most exciting innovations on the horizon. Every chapter balances entertainment and education thanks to the author’s wit, scientific background, and colloquial tone. The book takes a sky-high view of most topics, covering as many different technologies as possible in a relatively small space. This choice creates a rapid pace that should generate curiosity among readers, but which will also leave them with more questions than answers since the book cannot cover any one topic in great detail. The end result is an engaging survey of the incredible technologies fueling the chaotic cohesiveness of cities today and tomorrow, leaving readers with a desire to search for more information once they’re done with this exhilarating ride. Provided by Bloomsbury Publishing (www.bloomsbury.com/author/laurie-winkless). Laurie Winkless is a physicist and writer, currently based in London. Following a degree at Trinity College Dublin, a placement at NASA’s Kennedy Space Centre, and a master’s in Space Science at UCL, Laurie worked at the National Physical Laboratory, specialising in materials. Thermoelectric energy harvesting—where heat is captured and converted into electricity—was her bag, and remains a favourite topic of conversation. Laurie has been communicating science to the public for more than decade, working with schools and universities, the Royal Society, Forbes, and the Naked Scientists, amongst others. She’s given TEDx talks, hung out with astronauts, and appeared in The Times magazine as a leading light in STEM. Science and the City is her first book.